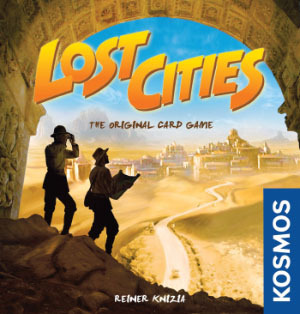 Lost Cities is a two player card game about exploring ancient ruines. The theme is based around archaeological expeditions. The gameplay is simple so even new players will be playing in minutes. 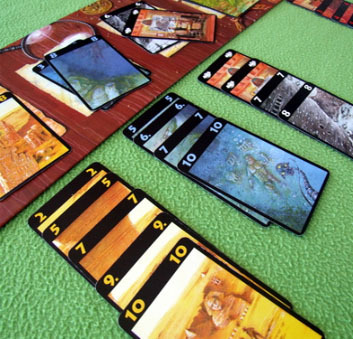 The game is based around drawing cards. These have different 5 colors representing the expeditions the players are going on. The number (1 to 10) on the card represent different stages of the expedition. The player should collect the cards in ascending order and will score many points for long sequences. The explorer with the highest score on the end of the game wins. The players must choose which sites to explore and which to leave behind. The game starts with each player getting a hand of 8 cards. On each turn, the players play or discard one card, then draw one card. 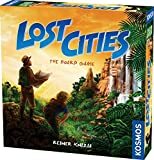 You can only play a card on your side of the board on the color of the city you’d like to explore. The card you play must be of a higher value than the last one you played. Each color also has 3 investment cards. They are like zeros and must be played first. You can also choose to discard a card in the middle of the board on its corresponding color. You end your turn by drawing one card from the top of the draw pile or the top card from one of the discard piles in the center of the board. Making you play before drawing makes it always a nerve racking choice. You also have to decide what to ditch to make room for cards you want. Beware that the discarded card is maybe the one your opponent really needs and by this you give him points. Sometimes, it's even better to keep cards until your opponent is unable to use them. The game finish when the last card is take from the draw pile and then the scores will be recorded. Each expedition scores separately. Colors with no cards on them are counted as zero. Colors with cards start with -20 points and then all values of the cards will be added. Investments multiply the value of your expedition and you can have 1, 2, or 3 investments. When an expedition has 8 cards, then it scores a bonus of 20 points added after the multiplier. The game is not all based on luck. Well, you will need luck but the heart of the game is deciding whether you are taking risks or play conservatively. You also have to choose if you will spread yourself thin starting columns in various colors or do you focus on a few colors. In such case, you must hope your opponent isn't going for the same colors. 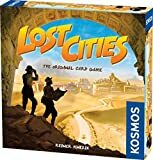 So, the Lost Cities is a mix of strategy and luck. Most games can be finished in less than 30 minutes. 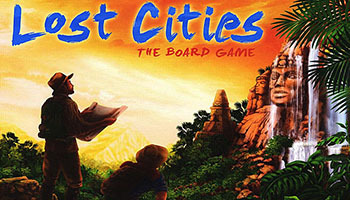 The game has been designed by Reiner Knizia. It's an execellent game for couples, even when one of them isn't into board games that much. Place the game board between the two players. It depicts five spaces for discard piles. Shuffle the 60 playing cards and give eight cards face down to each player. Organize the remaining cards into a draw pile and place them face down beside the game board. If you play more than one game, have a pen and paper ready to record the ongoing scores.